Terrell is ready for a bang up 4th. Join us at Ben Gill Park Saturday night for all of the fun. Click on the flyer to the right for more details. 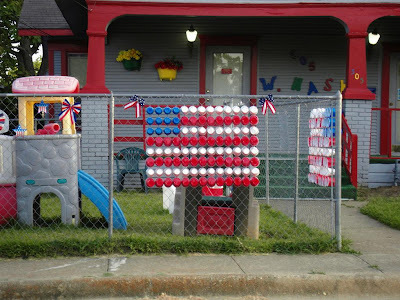 Those are plastic cups on the fence. The actress who played Mrs. Slocombe died. I loved watching her show on PBS. Today is our last day of work for the week. Traffic should be light.